Today, Mayor Jenny Durkan issued a proclamation supporting the Community Development Block Grant (CDBG) and Home Investment Partnerships (HOME) programs, joining the Human Services Department (HSD) in recognizing April 2-6, 2018 as National Community Development Week. Organized by the National Community Development Association, the week-long celebration is an opportunity for cities to bring together government officials, the business, non-profit, and philanthropy sectors, and community members to showcase the impacts of CDBG and HOME dollars in the local community. In Seattle, HSD’s celebration event featured the University Commons. 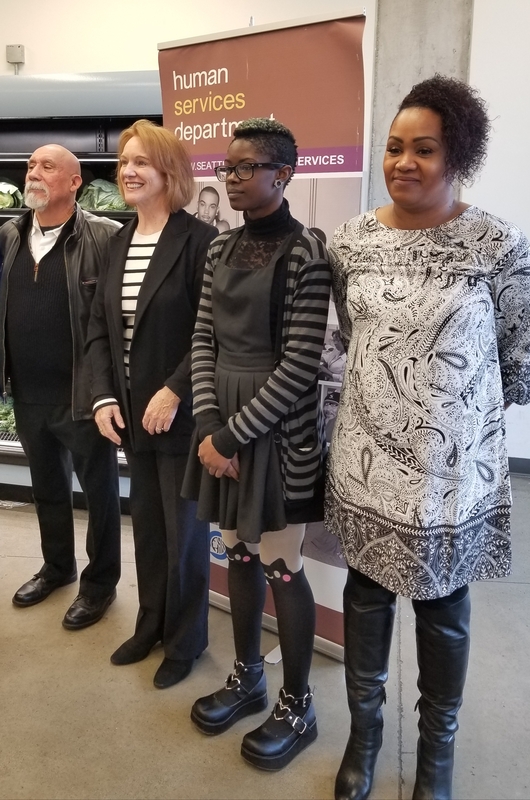 The University Commons is a new multi-purpose facility that serves the community through housing, case management, food access services, job training, and is one of several projects that have received either CDBG or HOME dollars in the City of Seattle. Over $2 million in HOME funds were used for the development of the University Commons facility that provides 20 studio apartments for youth experiencing homelessness, and 29 larger studio apartments for individuals with lower incomes. The University Commons also houses the University District Food Bank and Street Bean Coffee—serving business and community partners that serve the youth and young adult residents and the University District Community. 13 schools partner with the University District Food Bank to provide weekend meals to nearly 650 students in the free and reduced lunch program. Further, the President’s FY19 budget proposal eliminates both programs altogether. “Here in Seattle, the demand for rental assistance, affordable housing, homeless intervention services, and other community service needs continues to increase despite the rapid economic growth seen in the City. As a result, the need for CDBG and HOME are needed more than ever to help our most vulnerable residents and improve the overall condition of our neighborhoods. I am urging Congress to reject proposals that would eliminate HOME and CDBG, which are vital for cities to leverage to make transformational projects happen,” said Durkan. This year marks the 44th anniversary of the CDBG program. The CDBG program provides grants to over 1,200 state and local governments to create neighborhood approaches that improve the physical, economic and social conditions in communities. Both programs play a vital role in attracting investment into low- and moderate-income neighborhoods. Every $1.00 of CDBG leverages another $4.11 in other funding; bringing additional vital resources to communities. The HOME program, now in its 28th year, provides grants to over 600 local participating jurisdictions to create safe, sanitary, and affordable housing in communities nationwide. Every $1.00 of HOME leverages an additional $4.33 in other funding. Both programs are administered nationally by the U.S. Department of Housing and Urban Development.